When asked if I would be interested in helping to deliver a boat to Florida I had to think for about a second before saying YES! Steve and Karen, whom we had met on Sol Mate last year in the Bahamas, were planning another trip this year. Since Ginnie and I decided to stay up north to experience the Polar Vortex’s we had missed the previous two years, I was available for the trip to Florida. 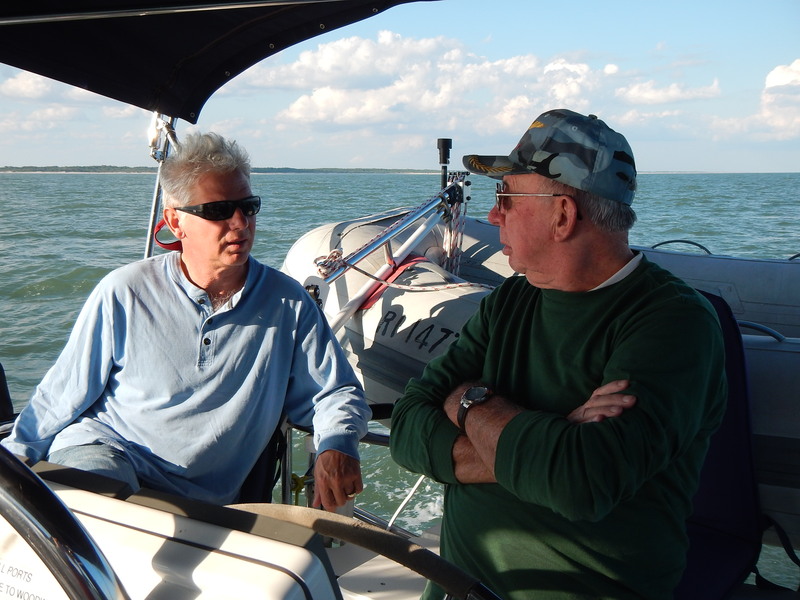 The plan was for two old salts (Mike and I) and one semi-old salt (Steve) to deliver the boat from Pettis Boat Yard in Warwick, RI to somewhere in south Florida so Karen and Steve could continue on to the Bahamas after Thanksgiving. We departed Pettis Boat Yard at 0400 hrs on Sunday October 18th. Yes that’s 4 AM to give us an arrival time in Norfolk, VA during daylight hours. The trip down the bay was uneventful. Near the entrance to Great Salt Pond in Block Island the boat decided that going in circles was far more fun than just simply following the track set into the auto pilot. 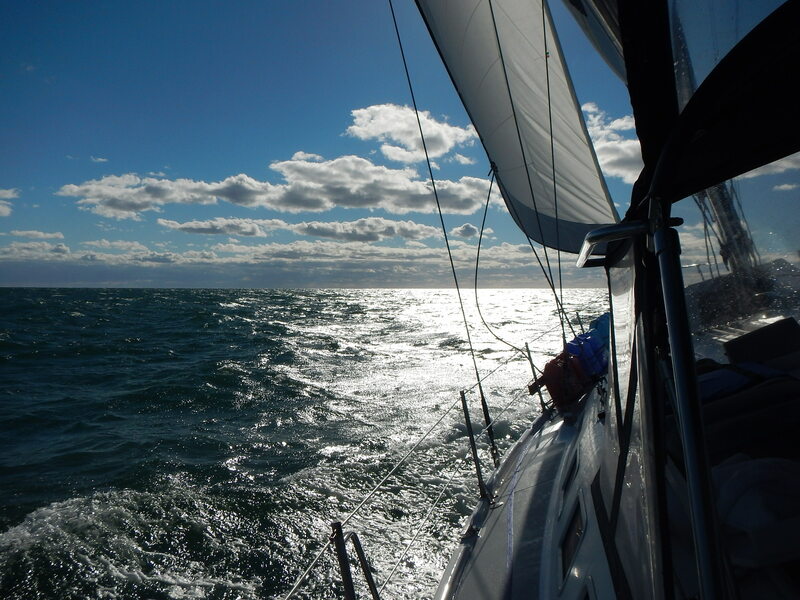 Seas building, wind picking up, and no auto pilot, this could be a very long trip. The decision was made to lay into the Block and try to fix the auto pilot. It was a simple fix, the linkage arm had popped off. After much debate and extensive engineering, we simply snapped it back on and wrapped the connection with electrical tape. (It worked throughout the trip to Florida and is probably good for another 50,000 miles). We were on our way an hour or so later. 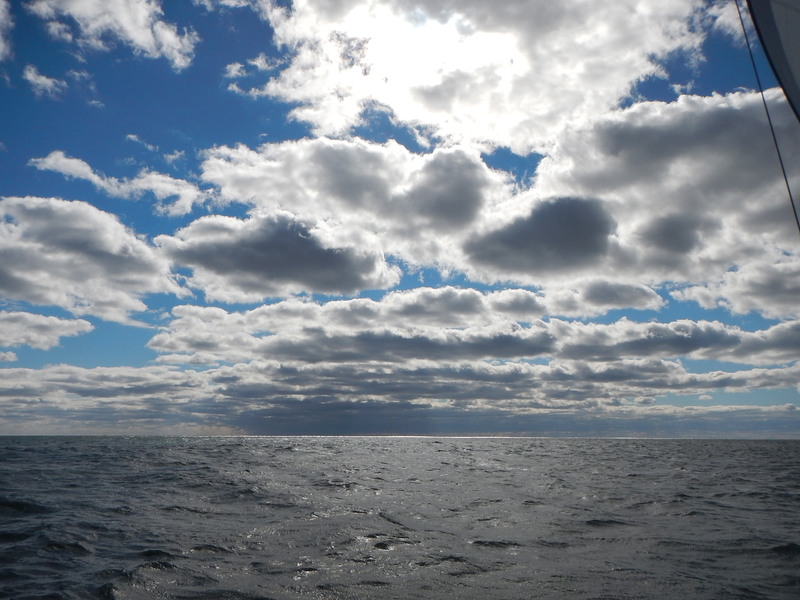 We passed Montauk at 1200 hrs with 22 to 30 knots of wind and building seas. Leaving New England in mid October almost always guarantees a few days and nights of cold weather and we were not to be spared. 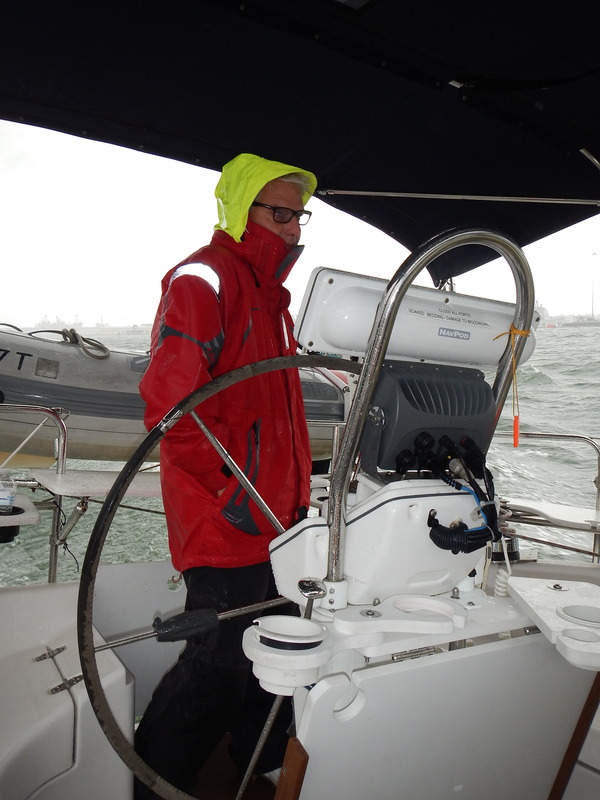 The first overnight was windy, with heavy seas and you guessed it, it was cold. Approaching Cape May the next day at 1745 hrs with 20 plus knots of wind on the nose and 6 plus foot seas, we easily made the decision to stay the night in the Cape May harbor. It was a good choice since it was warm and calm and we needed an early morning departure to be in Norfolk early Wednesday morning. Approaching Norfolk at about 0400 hrs we were in the middle of a powerful squall with heavy rain and lightning. We arrived in Norfolk shortly after sunrise and docked at the North Landing – Ferry Stop, a small pocket off the Elizabeth River. 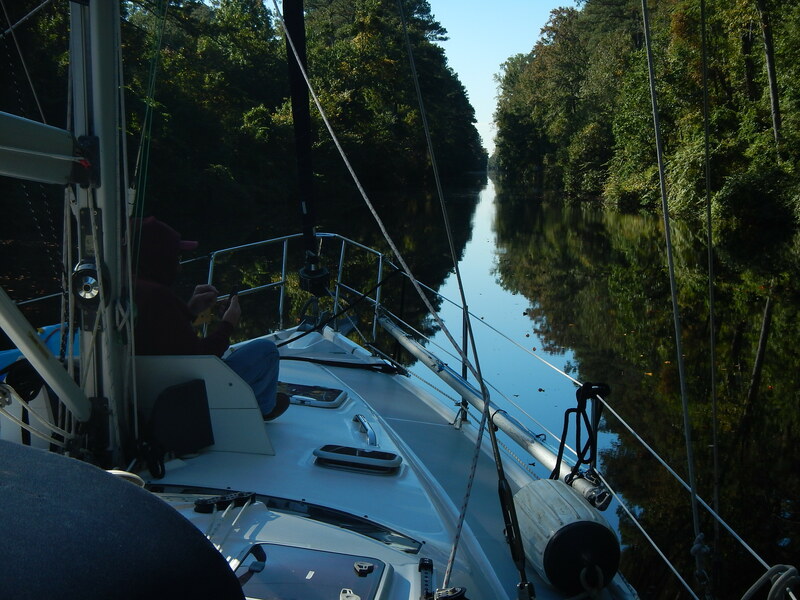 Early the next morning we started down the ICW taking the Dismal Swamp route headed for Beaufort, NC. Our next night was in Elizabeth City, then Belhaven, NC where we caught up with Bill Roy on board Providence. The fourth night on the ICW was in Moorhead City docking and dining at the Sanitary Restaurant. We wondered who thought that was a good name for a restaurant. Sunday morning we left the “Sanitary” for a run on the outside, around Cape Fear, down to Fernandina Beach, FL. So 350nm in 52 hrs averaging 6.7 kts definitely was not bad. The next leg was to Ft. Pierce, FL, about 215 nm. We left Fernandina Beach at 2000 hrs for the 36 hour sail to Ft. Pierce arriving Thursday October 30th in the morning. 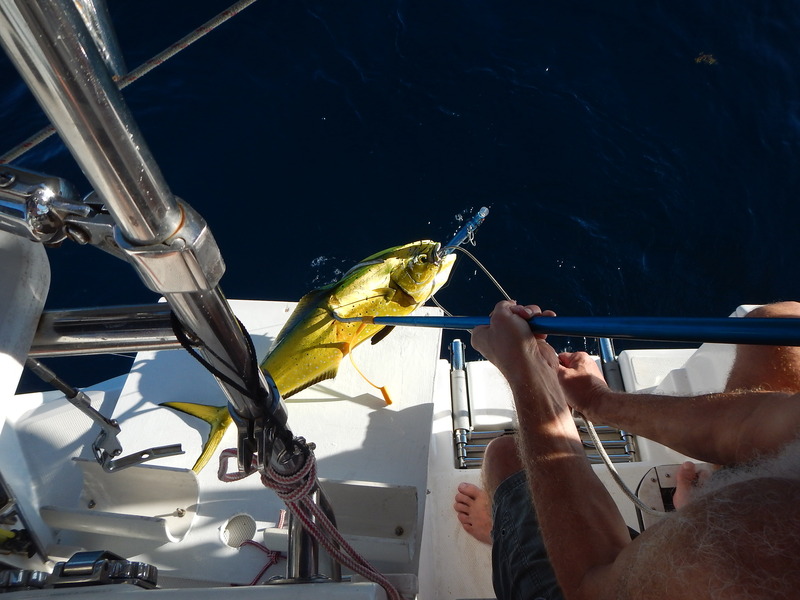 The 1160 nautical miles in 12 day was a great trip! 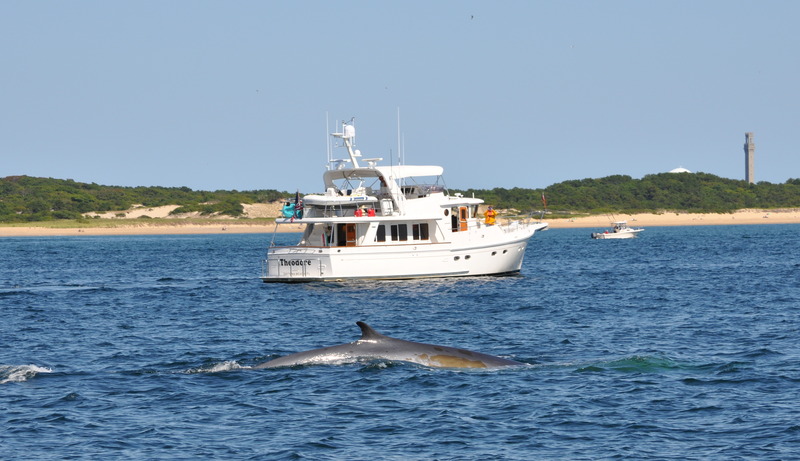 Heading north up the Sakonnet River brought back some wonderful memories. As a teenager I had sailed here often. 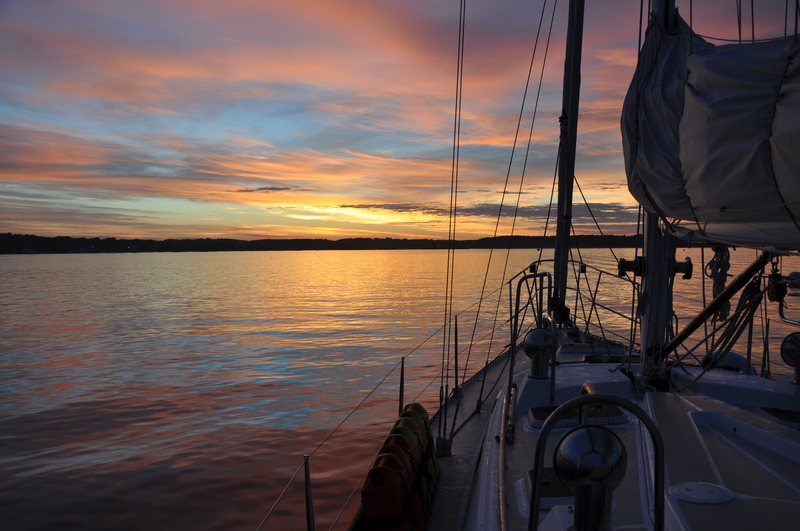 We anchored just north of Fogland Point and enjoyed a great sunset and sunrise the next morning. 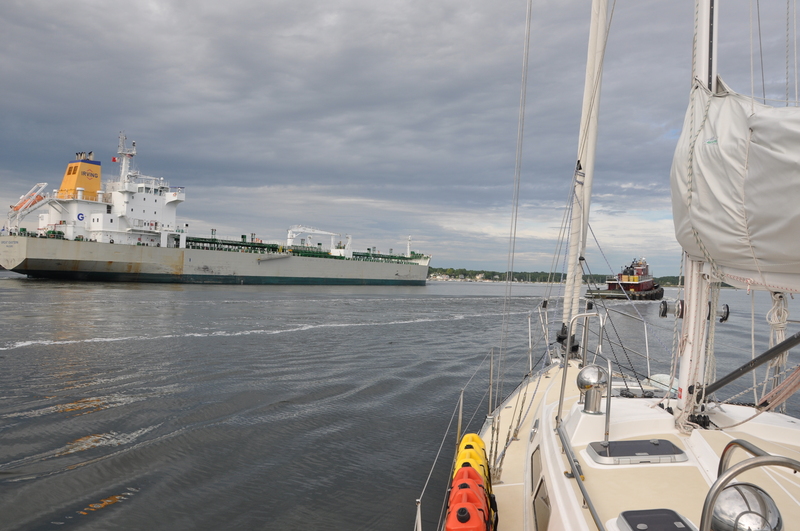 With little wind we motored up through the Tiverton Basin and then under the new Sakonnet River Bridge on our way up the Providence River to meet Steve and Karen (Sol Mate). Along the way the wind picked up and we were able to sail to the Rhode Island Yacht Club very close to their home. Steve and Karen were gracious hosts and we enjoyed seeing them again. Having a south west wind “On the Nose” we opted to motor down to Point Judith staying in the Harbor of Refuge for the night. This would give us a short sail to Block Island in the morning. 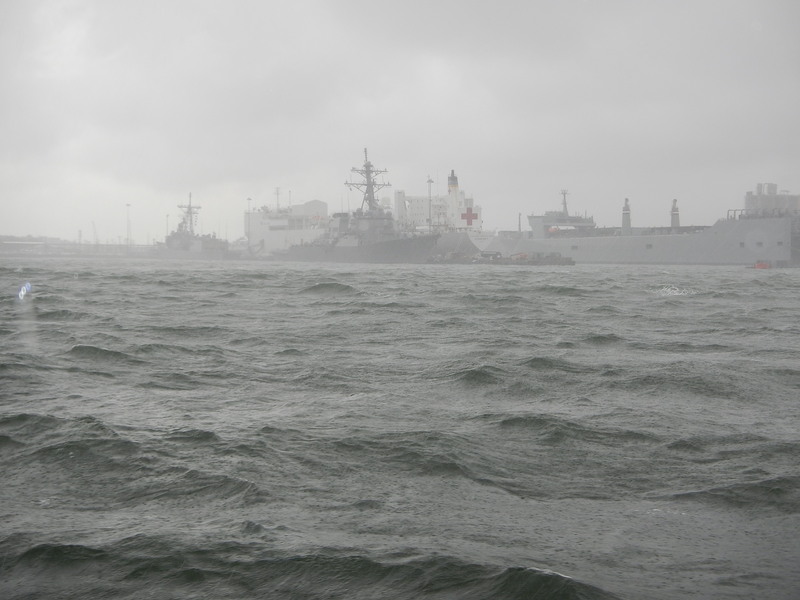 Sailing in Narragansett Bay was indeed Déjà vu All Over Again! Who was that woman out in the cockpit asking me to look at a boat? Couldn’t be Ginnie, she simply doesn’t look at boats. After many years of trying to get her to look at boats that I found interesting, this was too good to be true. This woman looks and sounds like Ginnie, but asking me to come up to see a boat that interests her, this had to be something special. Sitting on anchor in Onset Harbor we noticed that the name of the boat was Lucille. 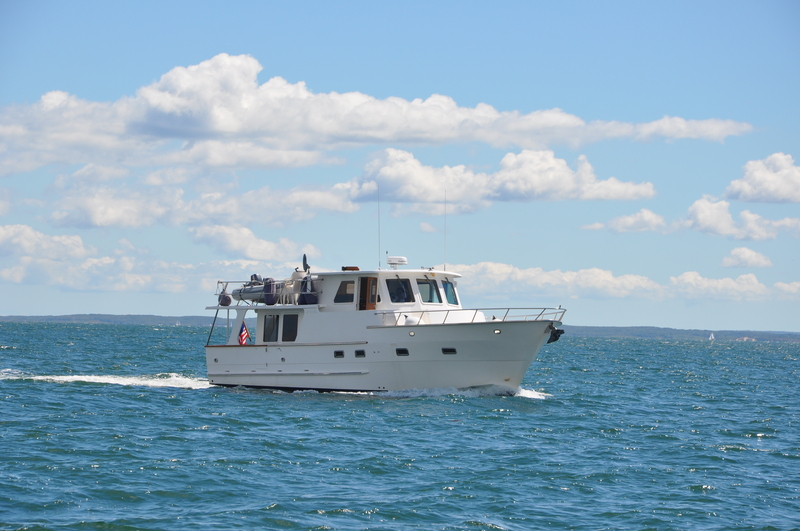 After a quick search of the USCG Documentation Database we discovered that it was a Defever 45 trawler, and she was right, it is a great looking boat. We dinghied over to see if anyone was aboard but didn’t see any activity. 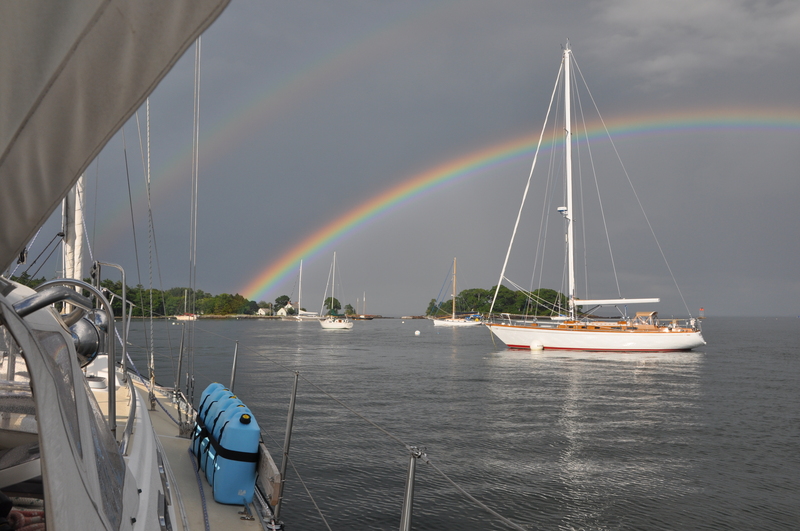 The next morning we left early heading down Buzzards Bay for the Sakonnet River. About two hours out we were hailed on the VHF by Lucille. 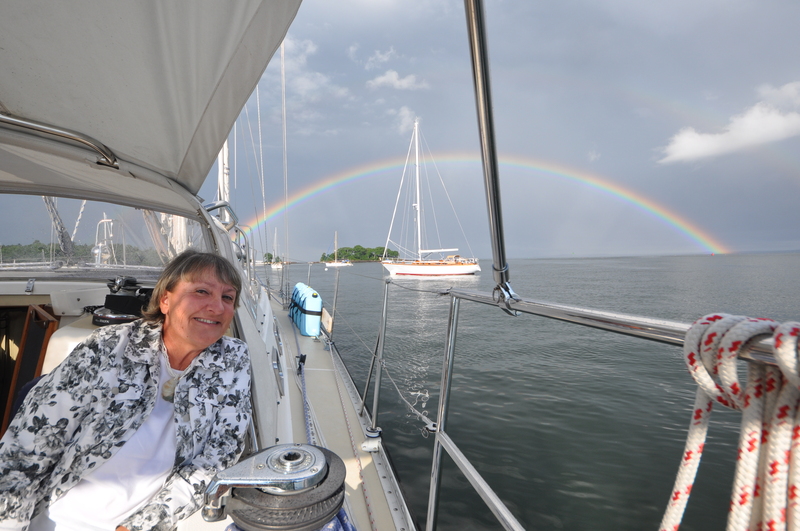 The owners Bill and Sandy called to tell us that they knew many Saga 43 owners and that they had sold their Sage 43 to move over to the dark side purchasing the Defever 45. We discussed our near future cruising plans and decided to meet in Block Island so they could give us a tour of Lucille. 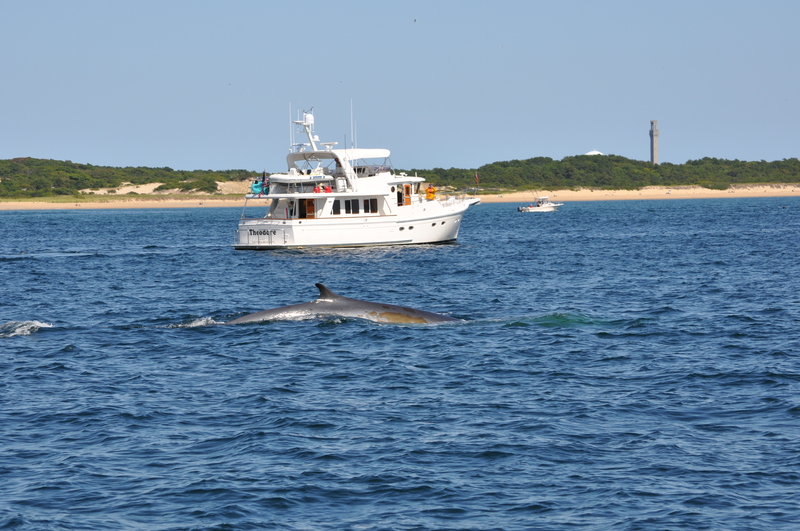 When we were approaching Dolphin Marine our friends George and Pat on Theodore happen to hear us on the VHF requesting a spot at the dock so that we could take on fuel and water. They just happened to be on the same frequency. Being not too far away we made plans to cruise together for a while. Our next stop was in Portsmouth, NH for a couple nights then on to Salem, MA where we also spent two nights. A busy harbor, that tug was a lot closer than it appears in the photo. Capt Ted Bear, our newest crew member happy to not be staying at the building in the background. The old Portsmouth Navy Brig. 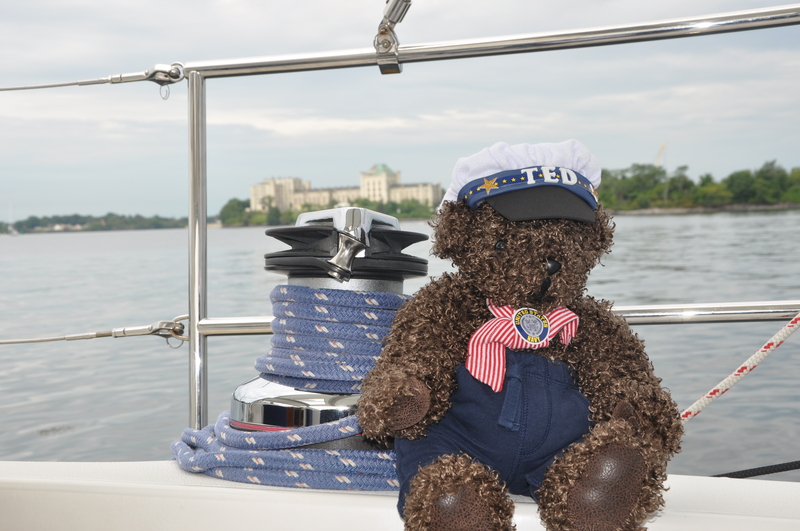 Capt Ted Bear is one of Linda’s newest creations and we are delighted to have him ob board. Thanks Linda. 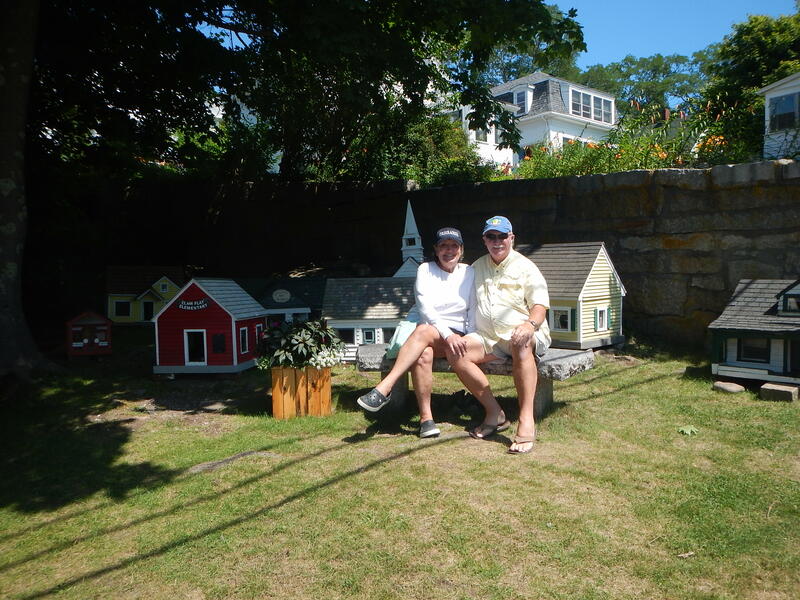 We both departed Salem for Provincetown where we were going to meet Don and Bev. Don and I had been shipmates on board the USS Rehoboth many, many years ago. We were looking forward to seeing them again. 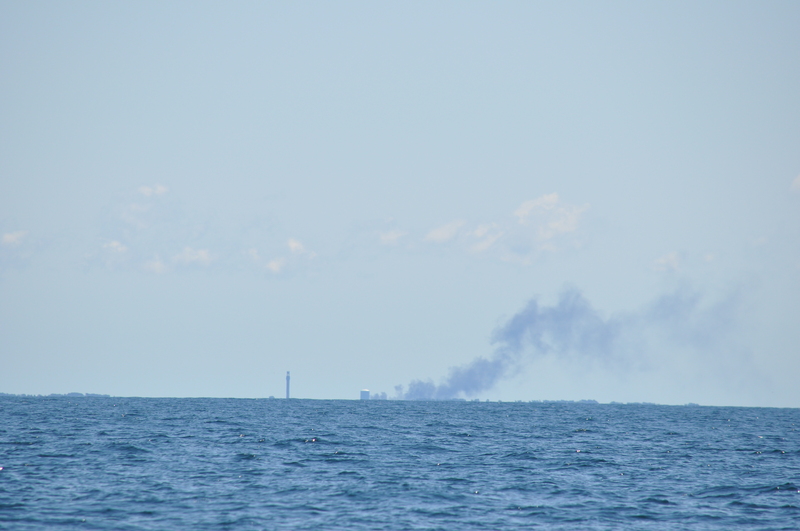 When we were about 12 miles from P-Town we heard the Coast Guard warning of a boat on fire in Provincetown Harbor. The boat sadly burned to the waterline but no one was hurt. The photo below is the smoke we saw from 12 miles out. Ginnie had been looking forward to seeing some whales sometime on this trip. 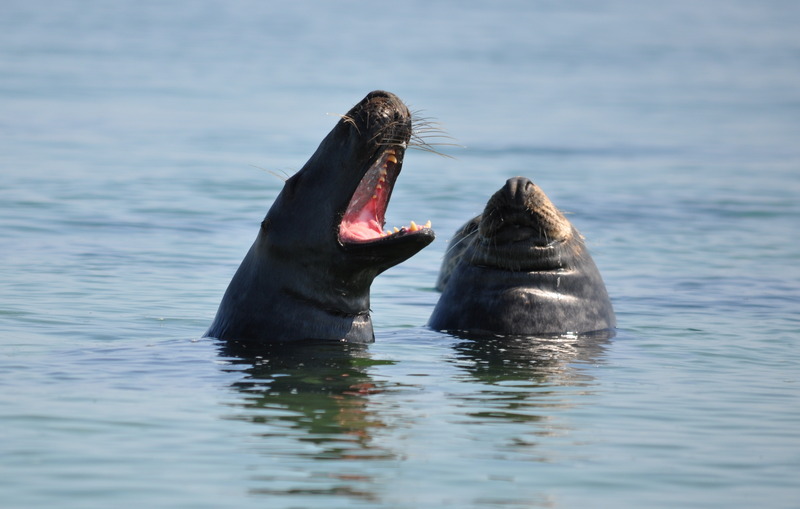 George and Pat turned north to Stellwegen Bank to the area frequented by the local whale watcher boats. 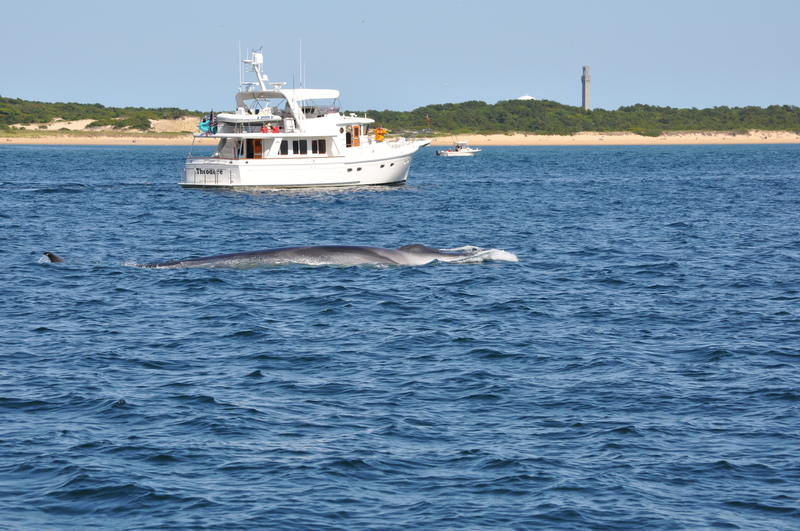 Ginnie and I were more interested in getting into P-Town early, so if we didn’t see any whales on our path we would take a whale watching tour out of P-Town. 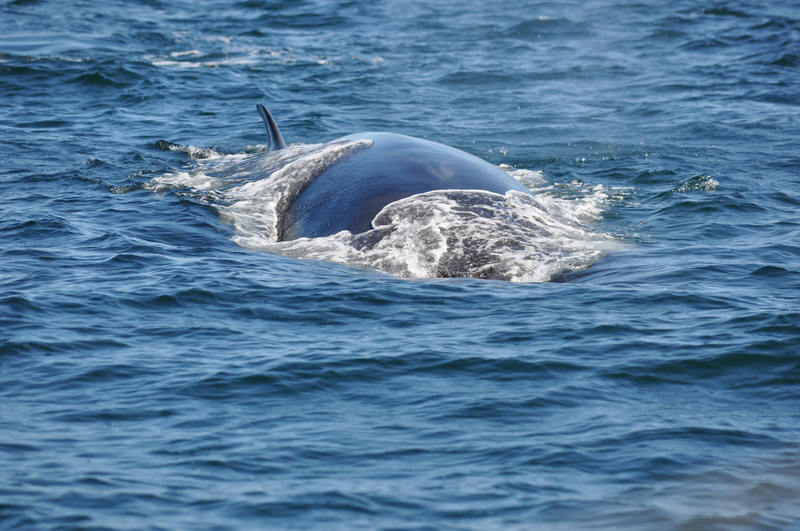 As we were heading into P-Town, just off Herring Cove Beach, we received a call from Theodore saying that there was a pod of finback whales just off the beach. 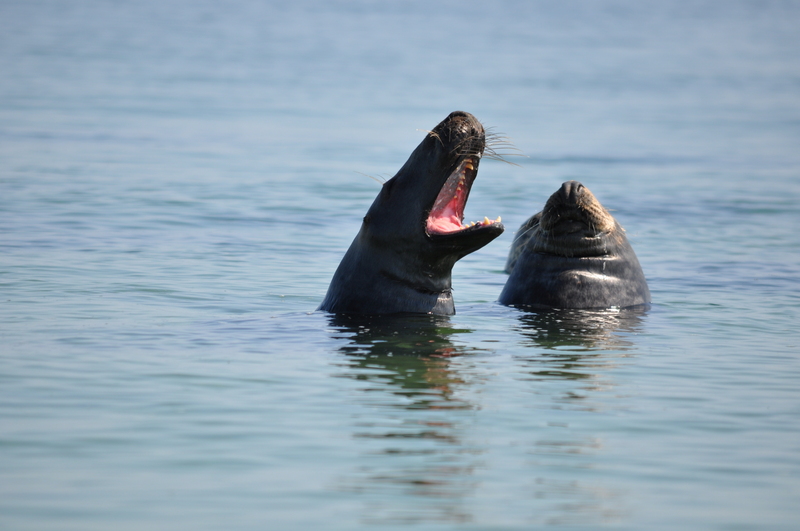 They had found no whales at Stellwegan Bank, but here they were so close to shore. 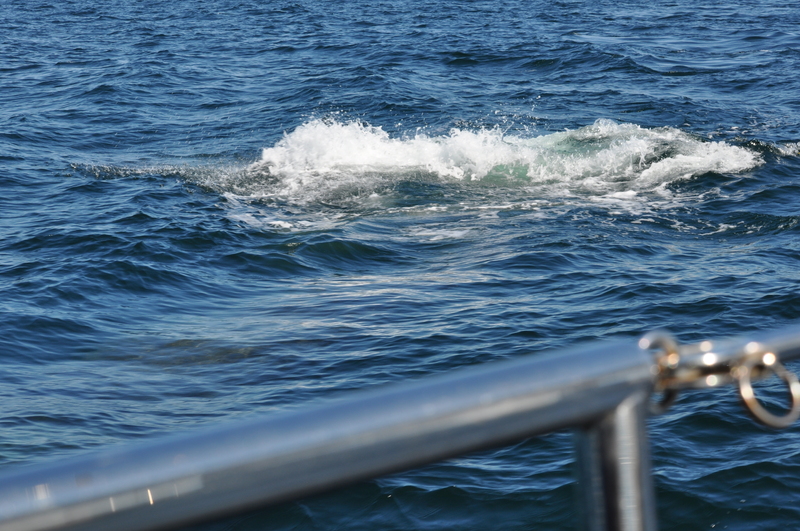 The next three photos show a whale turning and diving under Firecracker…Yikes that was close! 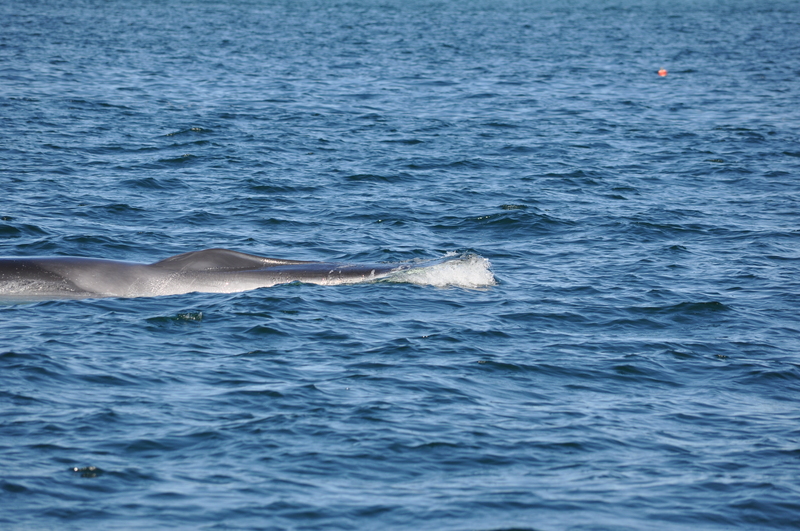 Second in size only to the blue whale, the finback reaches about 70 feet in length and weighs up to 70 tons. It shares with the blue whale the distinction of having the deepest voice on earth. The body is dark blue-gray above and whitish-yellow below, with a rather pointed head and a prominent back and dorsal fin which are easy to see. 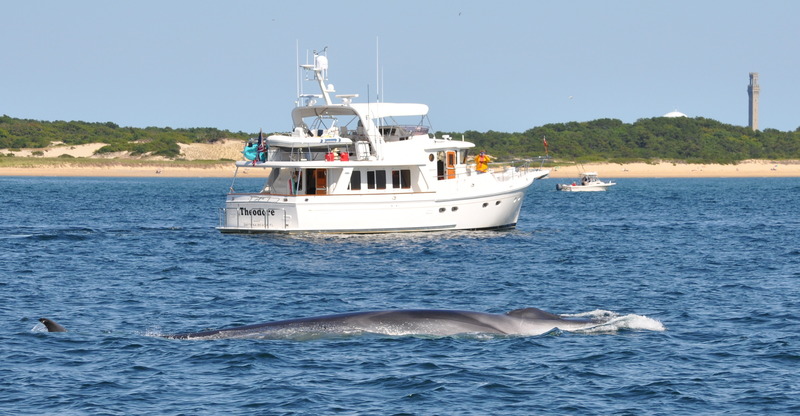 Cruising at an average speed of 12 knots, the finback is one of the fastest of the large whales, capable of short bursts of speed up to 30 knots. This species also makes some of the deepest dives of the baleen whales, up to 1800 feet deep, and has remained submerged for as long as 50 minutes on a single breath. The “V” shaped spout can rise as high as 20 feet. Finbacks tend to be restless and easily spooked. 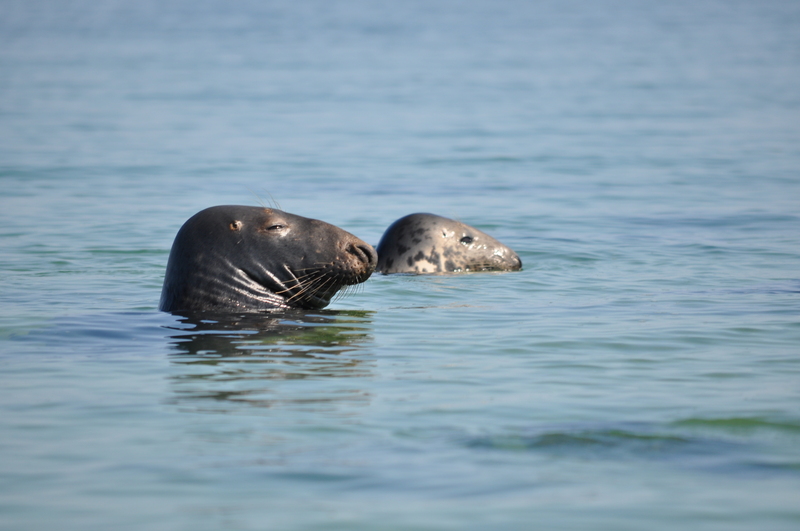 They avoid noisy boats, but will swim up beside a stopped vessel. 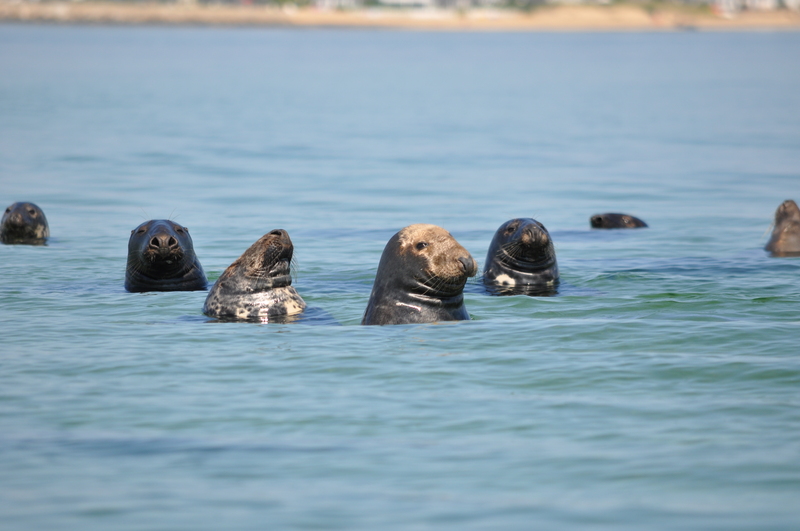 After settling in on our moorings George called us to go look for seals in the harbor. 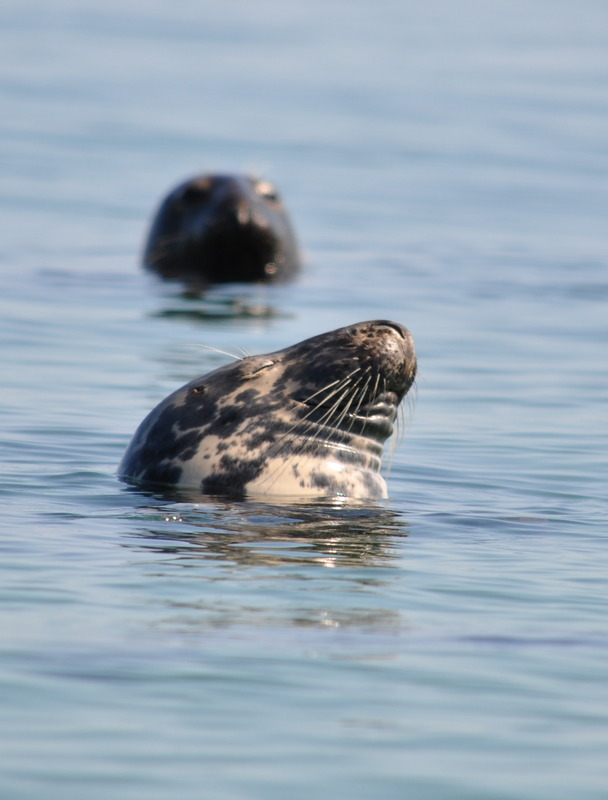 We had seen many seals on this trip but nothing to compare with this experience. 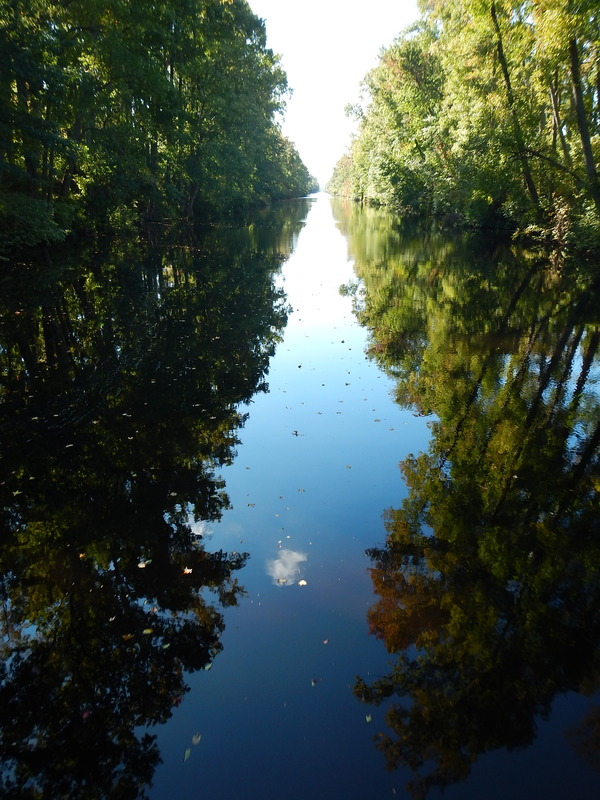 We shut off the dinghy engine and drifted close to get some great shots. 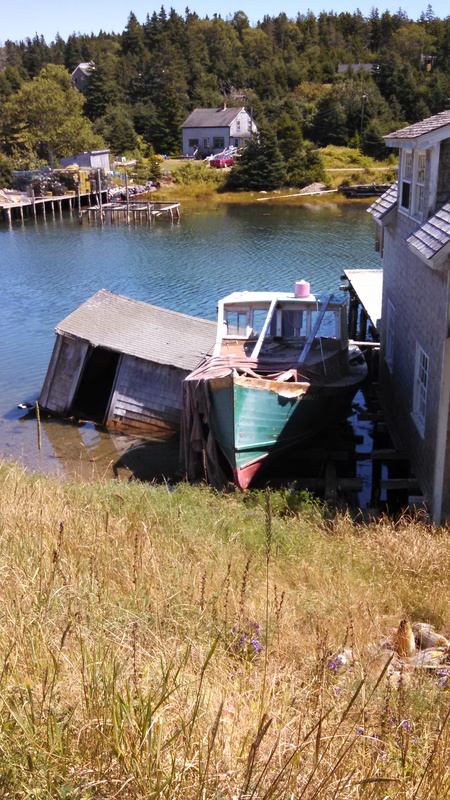 After leaving Camden we sailed down to Christmas Cove, a village in South Bristol ME. 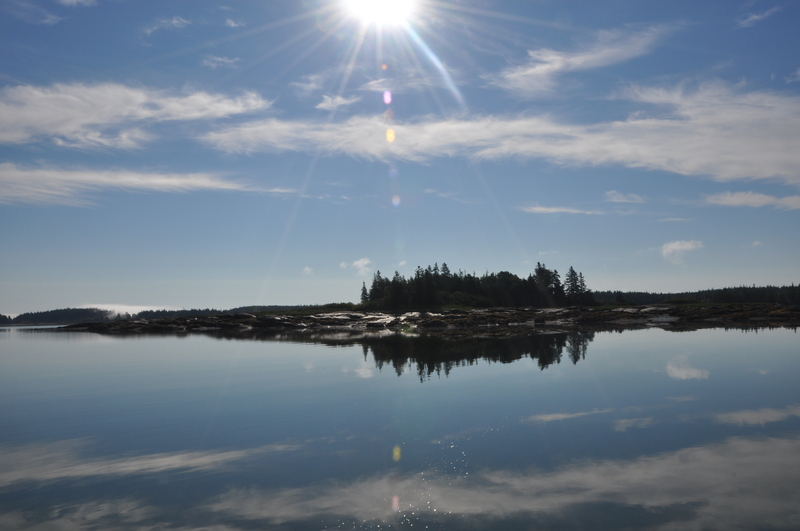 This was once territory of the Wawenock (or more precisely Walinakiak, meaning “People of the Bays”) Abenaki Indians, who traveled in canoes to hunt for fish, shellfish, seals and seafowl. In 1614, Captain John Smith explored the coast, and is said to have named Christmas Cove when he visited it on Christmas Day. 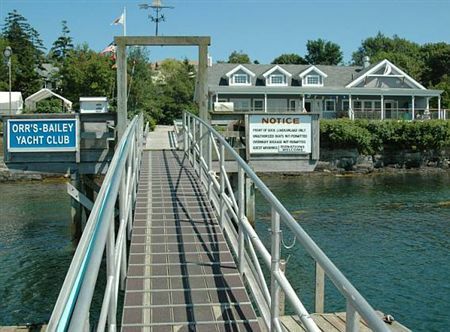 Our next stop was to drop off our guests and friends Dan & Linda at the Orr’s Bailey Island Yacht Club. 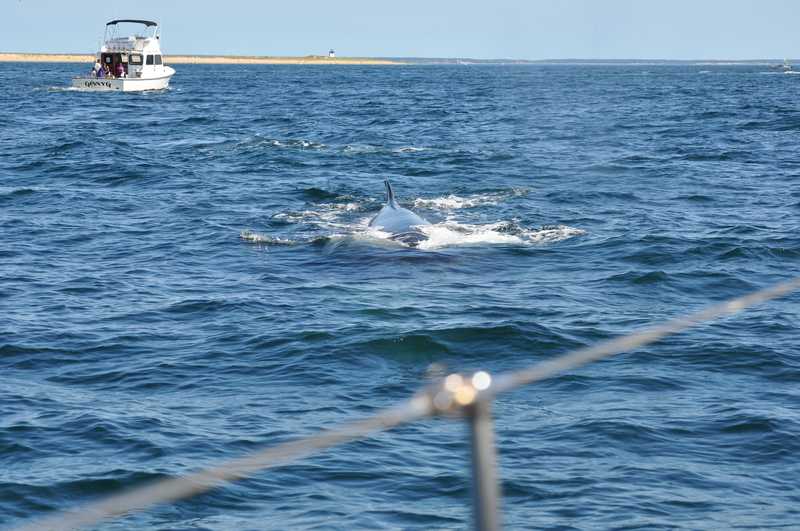 They had been cruising with us for the last two weeks. 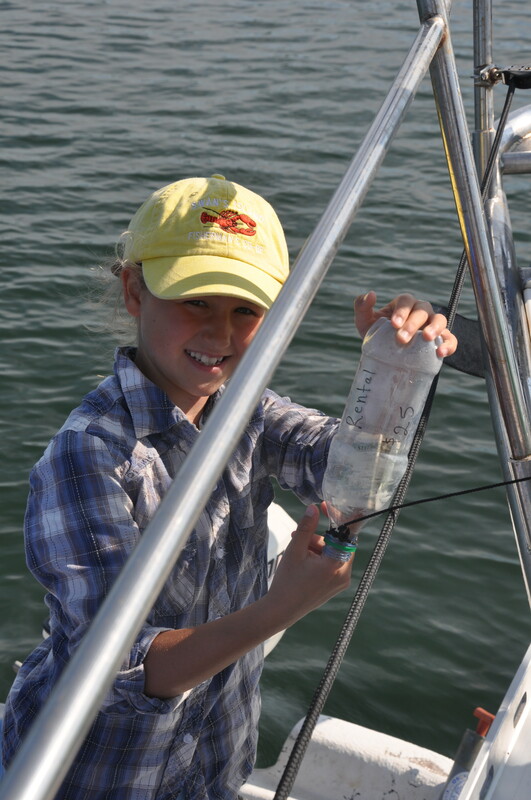 We enjoyed their company immensely and all their help in avoiding lobster pot buoys. No one on board had a chance of losing weight with Linda’s wonderful cooking. 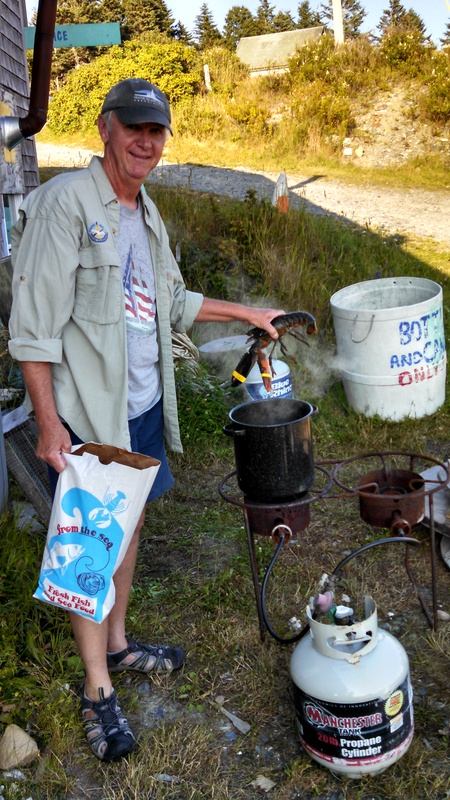 Chef Dan’s lobster cooking at Swan’s Island will remembered as a highlight. They had left their truck and kayaks in Orr’s Island so they could do some kayak camping on their return. The bridge connecting Orr’s and Bailey Islands is quite unique. 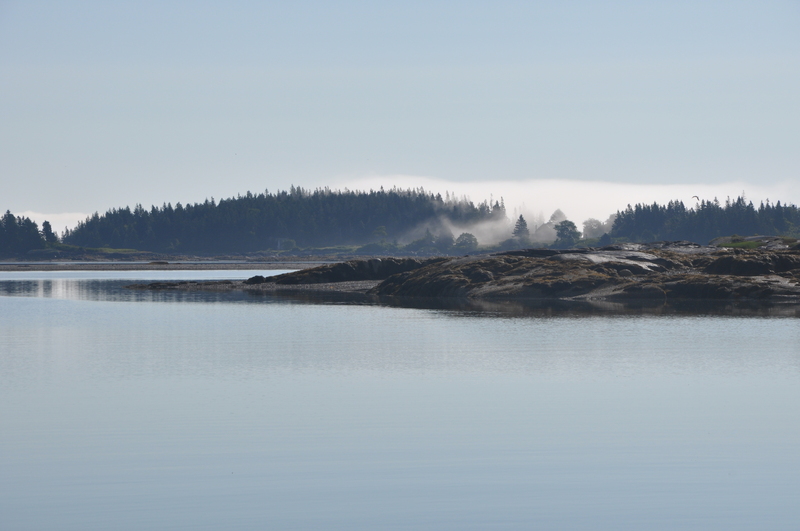 For many years, the fishermen who lived on Bailey Island wanted a bridge to connect their island with Orr’s Island, and for many years, the town of Harpswell turned down the request. But things changed when the Legislature approved a law allowing the State and the counties to participate in bridge funding, and in 1926, a contract was signed for construction of a new bridge. The bridge design presented some unique problems because of the tides in the area. It was decided to build a crib bridge using granite slabs from nearby quarries, similar in design to a bridge that had been observed in Scotland. The granite slabs were sufficiently heavy to withstand the buffeting of wind and wave and the open cribbing or cellular construction permitted the tide to ebb and flow freely without increasing the normal tidal current to any appreciable degree. A concrete roadway was placed on top of the granite cribs. 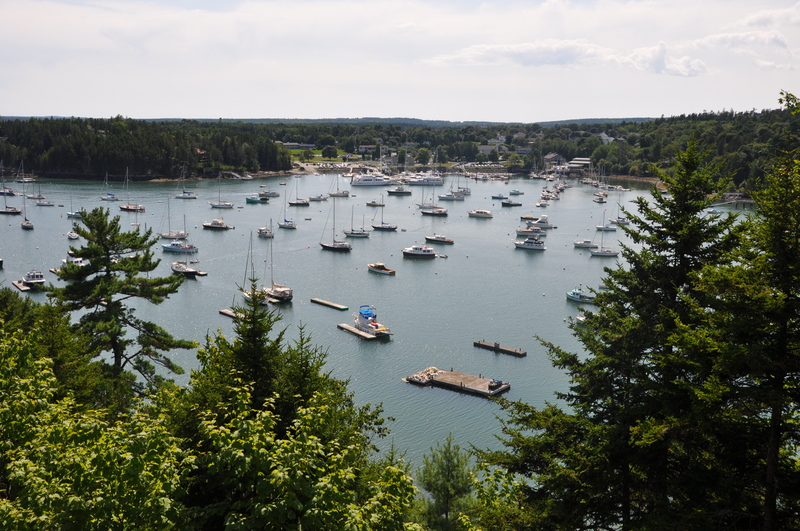 After leaving the yacht club we hopped over to Dolphin Marine on Harpswell Island for a few nights. 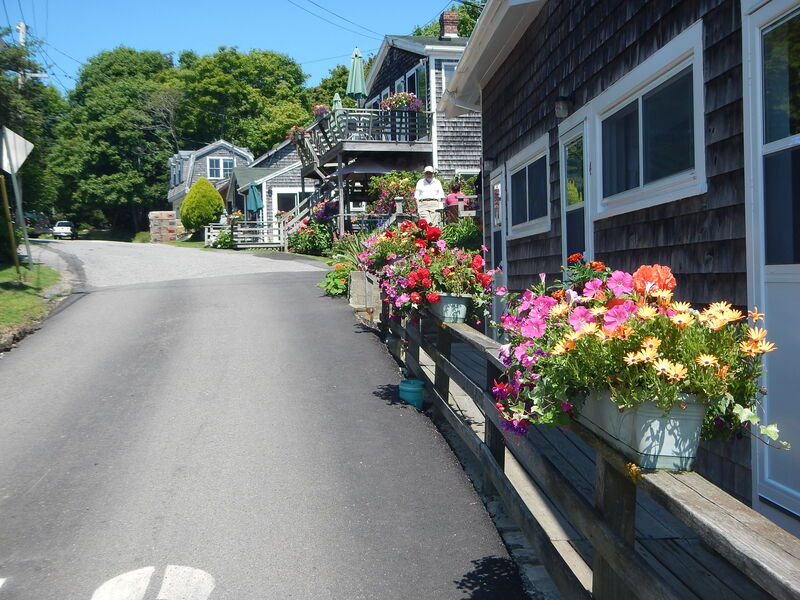 After leaving Camden and prior to arriving in Seal Bay we spent one night in Lunt Harbor in the town of Frenchboro which is located on Long Island, at the entrance of Blue Hill Bay, eight miles southeast of the town of Bass Harbor on Mount Desert Island. 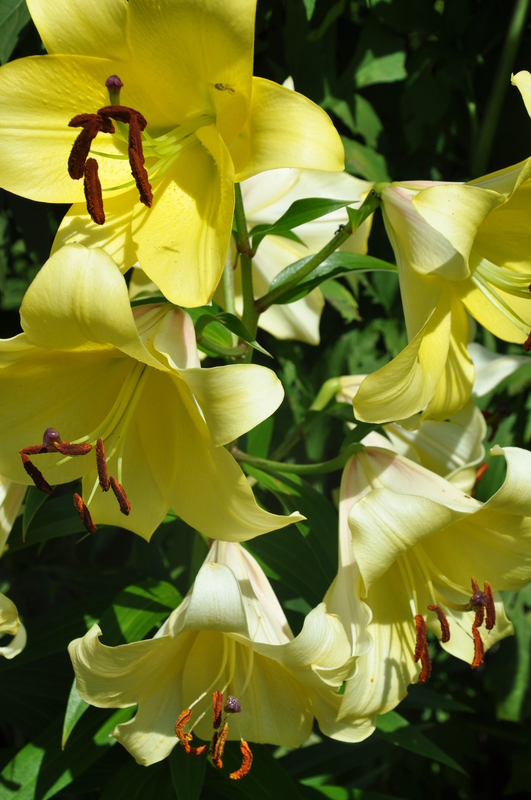 Harsh winters and very few conveniences are standard fare for the residents. The ferry visits the island three times a week, weather permitting. We found friendly and happy people living there which made our visit worthwhile. 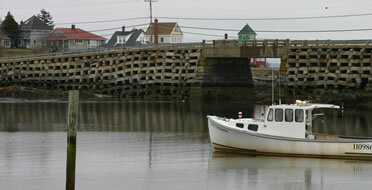 The economy of Frenchboro is lobstering and one great restaurant. We arrived in Camden with cloudy skies and a threat of a shower. 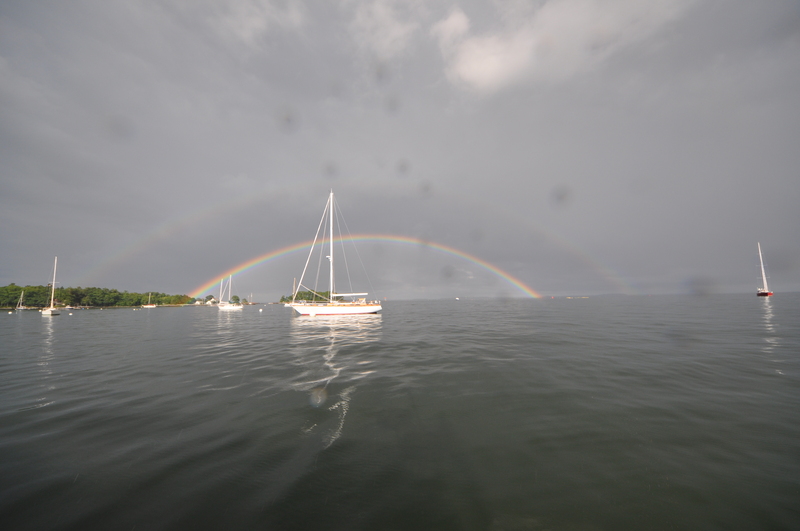 Shortly after picking up the mooring we did in fact get a little rain. 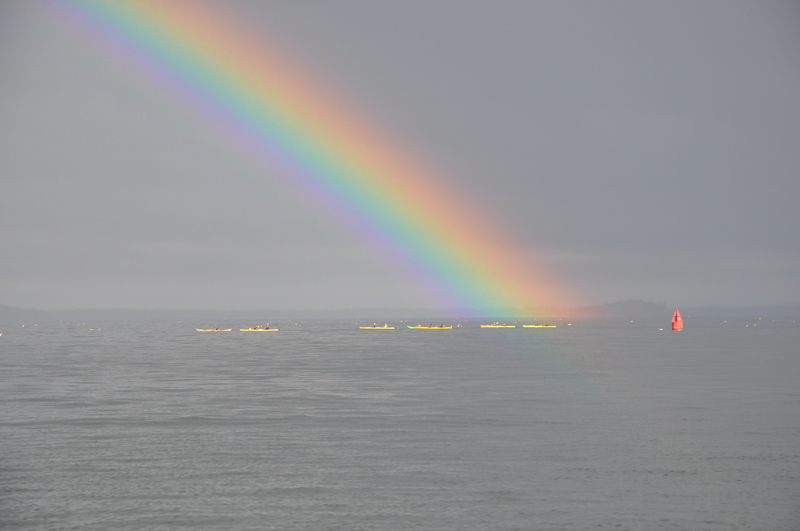 But rain can sometimes bring us the most beautiful rainbows. And on this evening in Camden we were not disappointed. 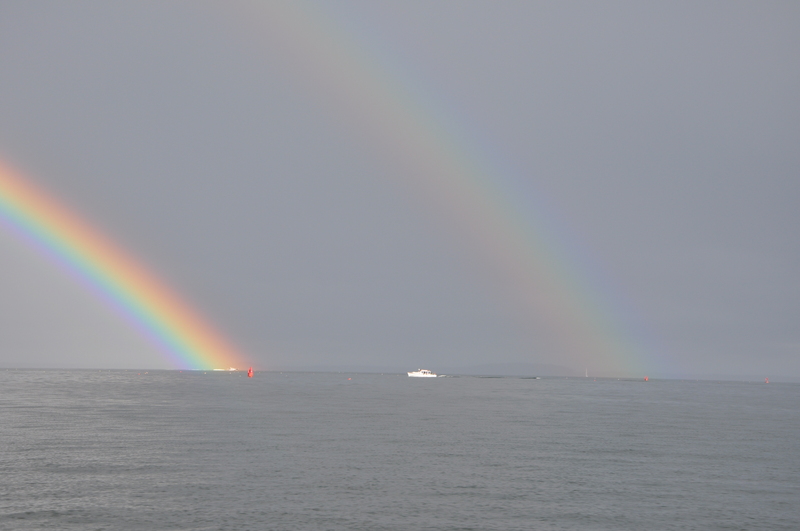 Not one but two incredible rainbows. If a photo is worth a thousand words I’ll stop now and let you view the photos. 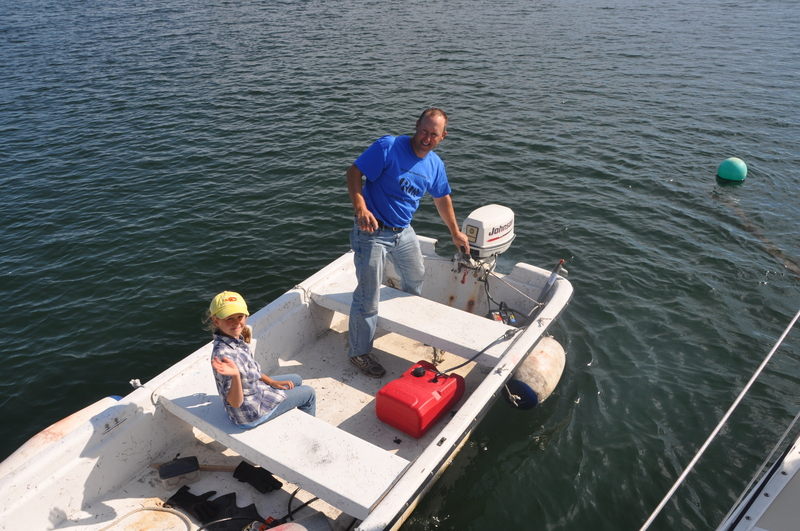 The mooring rental was from Wayfarer Marine. They had a courtesy car that we used to find a laundry and supermarket. The shops and restaurants there were very good as well. Ginnie was able to find goodies for Reese and Graeme. 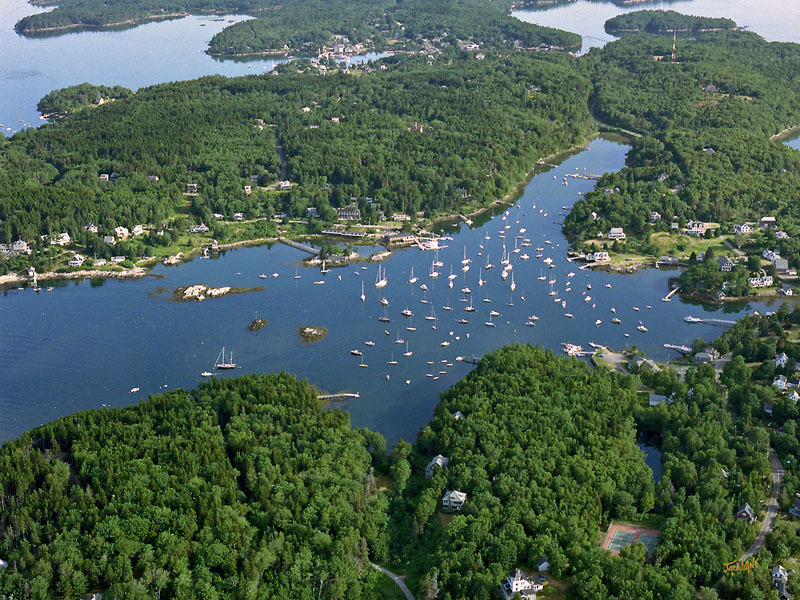 One of the prettiest places in Maine, Seal Bay, is a well protected anchorage in all winds. It is pristine and peaceful. Very few boats seem to find their way here. 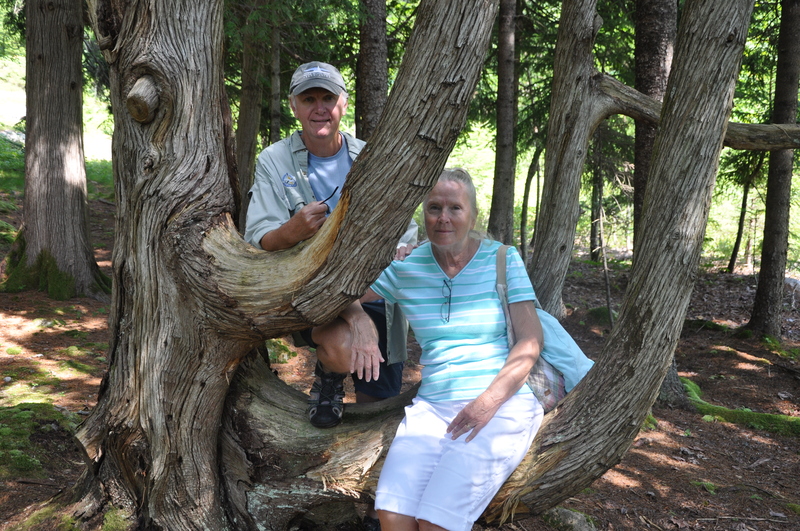 Dan & Linda have kayaked throughout Maine and were impressed we had found this unique setting. On our previous trip to Maine we spent a few nights here. We collected mussels for dinner and this year we stepped up our hunter/gatherer routine to include soft shell clams (steamers). 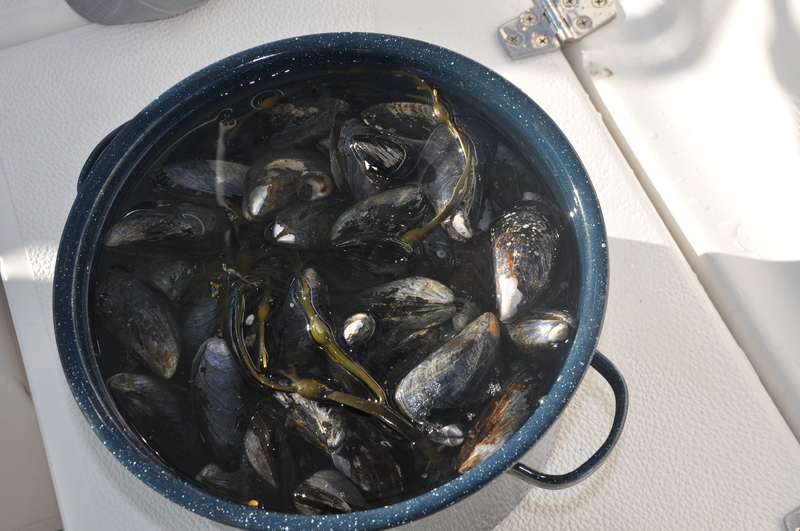 Dinner consisted of steamers as an appetizer and a dinner of steamed mussels with white wine, butter, garlic, sausage, onions and of course bread for dipping. OMG we couldn’t finish it all, so we had the leftovers as an appetizer the next day. Just after sunrise in Seal Bay. 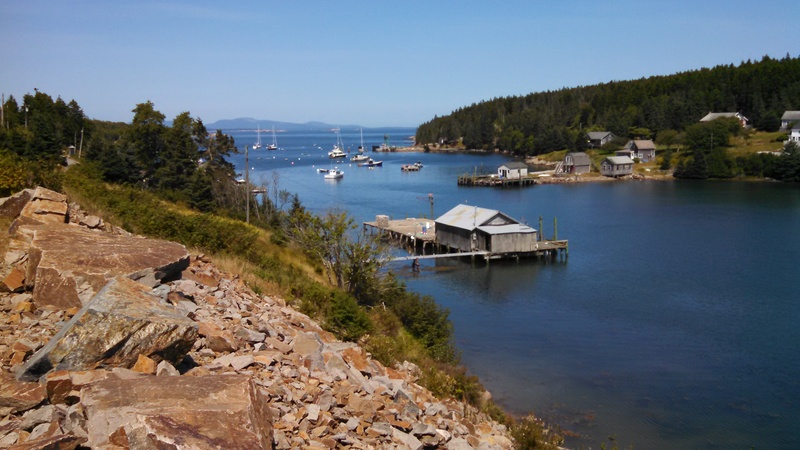 Going to Maine without stopping at Northeast Harbor would be a disappointment for us. Not wanting to be disappointed, we left Swans Island and sailed east. The term Eye-Candy had only one meaning when I was younger. Now I have to admit that there is a second type of Eye-Candy to be admired; those many beautiful, well cared for Downeast style boats in Northeast Harbor. 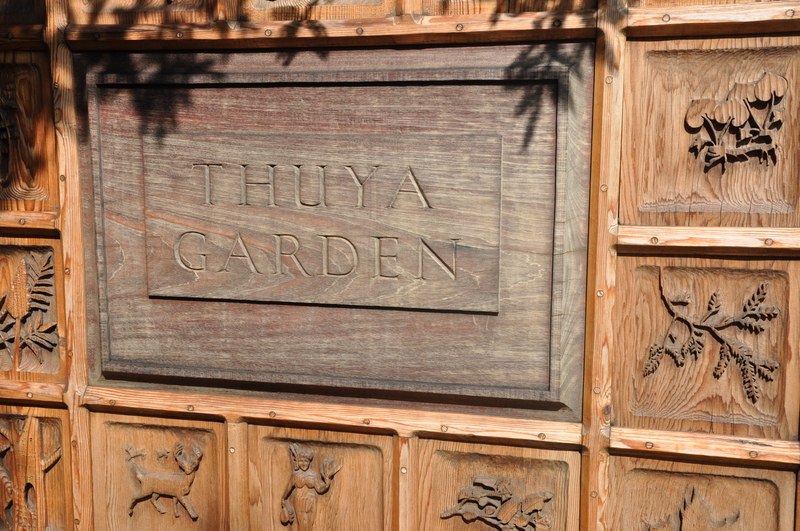 Also a must see there is Thuya Garden. 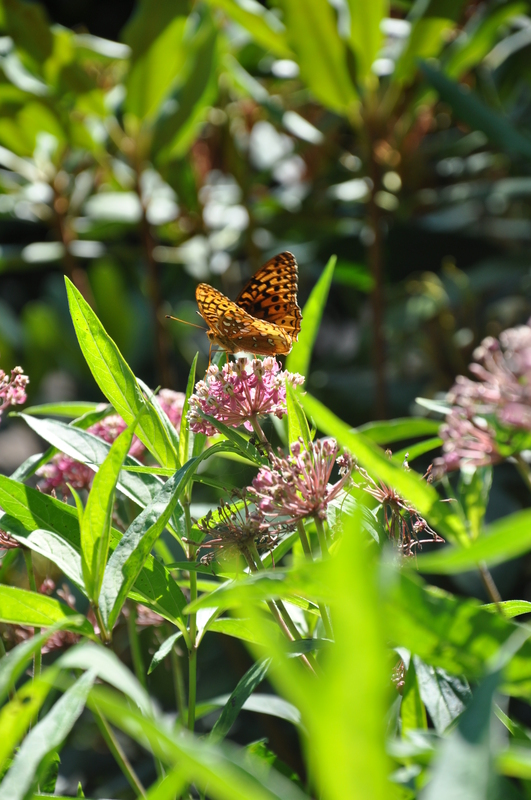 The totally organic garden and surrounding land is a wonderful blend of semi-formal English border beds and indigenous eastern Maine woodlands situated on a granite hillside overlooking Northeast Harbor. 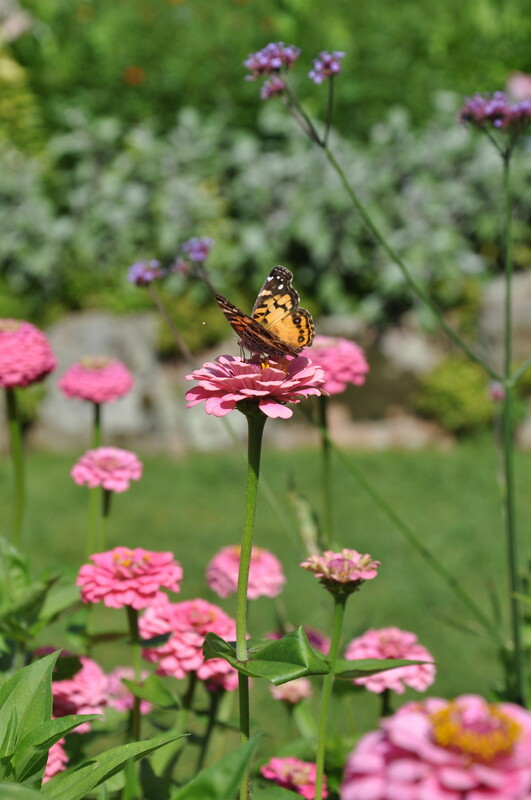 We dinghied to the Asticou Terraces Landing and walked up the 1/4–mile Asticou Terrace Trail to the garden and lodge, passing the Joseph H. Curtis Memorial and enjoying the views from several lookouts along the way. 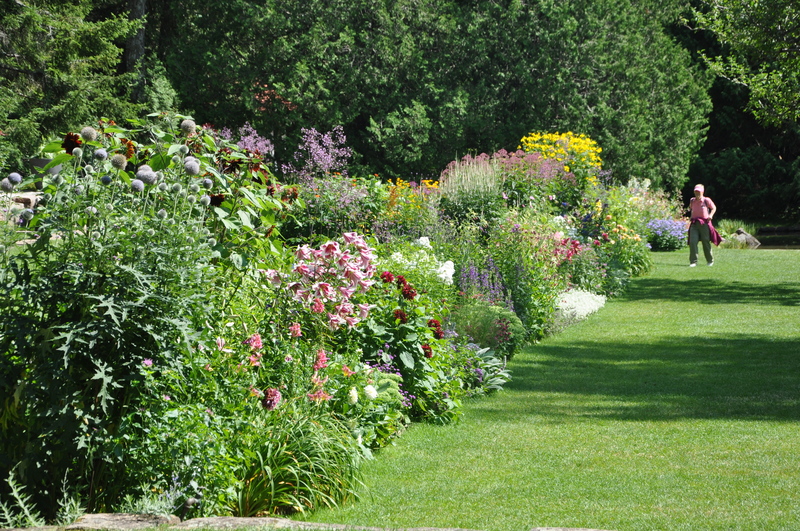 The garden’s borders are a mixture of colorful annuals and perennials defining the two sides of an expanse of grass lawns leading to the upper pavilion at the northern end and a shallow reflecting pool at the southern end. Below are just a few of the photos I took. 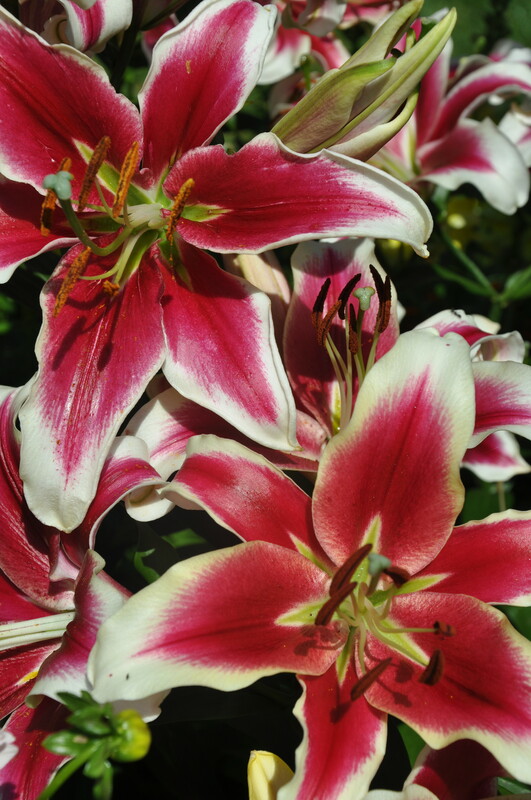 Dan & Linda sitting in a tree…….. The harbor from the trail going to the gardens. 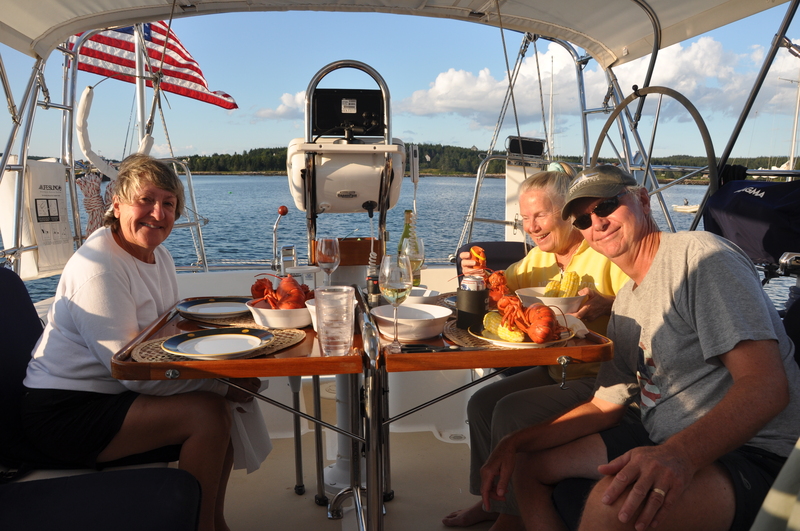 Meeting fellow cruisers from the Bahamas here in Maine is getting to feel routine. On our way here we received a call on the VHF radio from Dave & Suzy on Cay Paraiso. They were sailing south and called to ask if we were the Firecracker that was in the Bahamas. We were and had a long chat with them. Their home port is Wiscasset, ME. 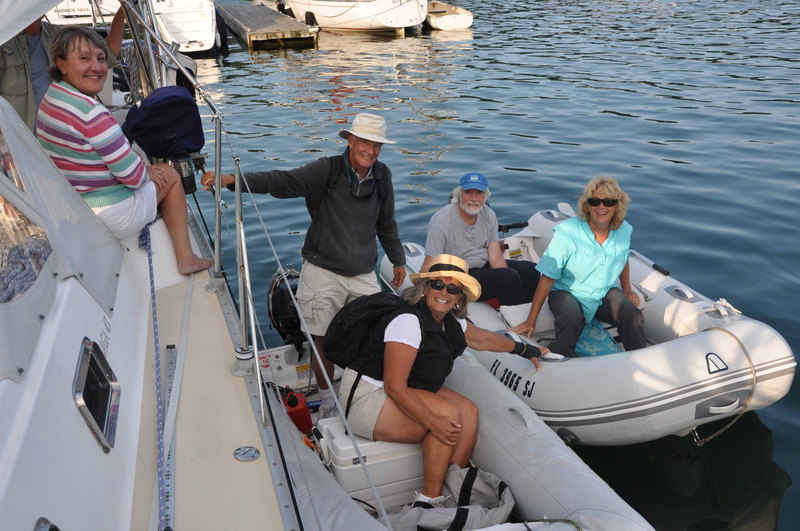 While on the mooring in the harbor two dinghies pulled alongside- Burt & Pru from Exuberant and Bill & Gayle from Spiraserpula whom we both met in, you guessed it, the Bahamas. It was great to see them once again. On our way to check in we met former neighbors on the dock who were from Mystic. It is truly a small world. From Boothbay Harbor we sailed to Rockland to visit with Devon’s sister Shay and her boyfriend Max and attend the Maine Boats, Homes and Harbors Show. I’ve been known to look at boats every so often; it’s so easy to do. 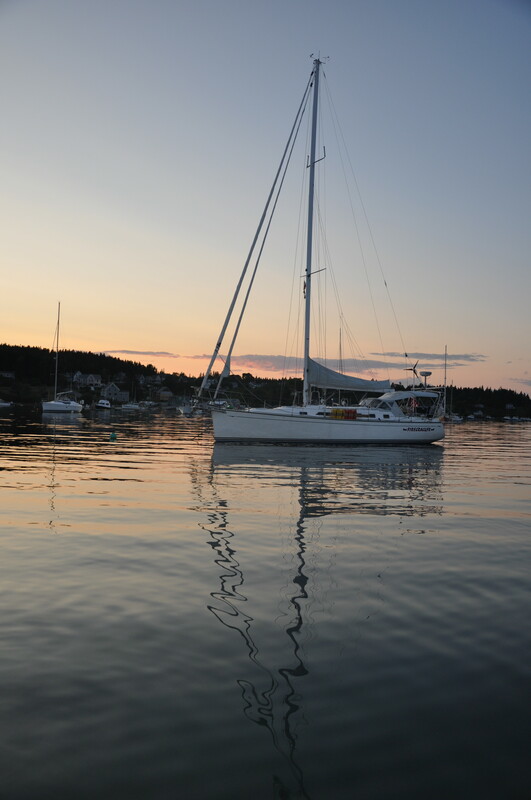 But being in Maine brings out my addiction with so many beautiful boats and so little time. 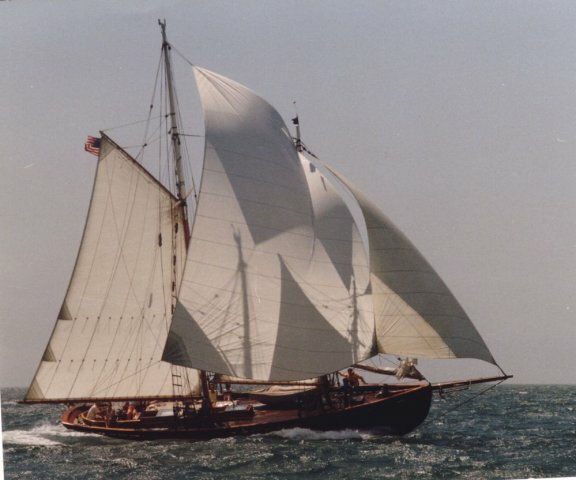 In a time long, long ago when I was a teenager (OK very, very long ago) I had the opportunity to sail aboard an Alden designed schooner named Voyager in Tiverton, RI. The owner was going blind and needed help to go sailing. I was available. 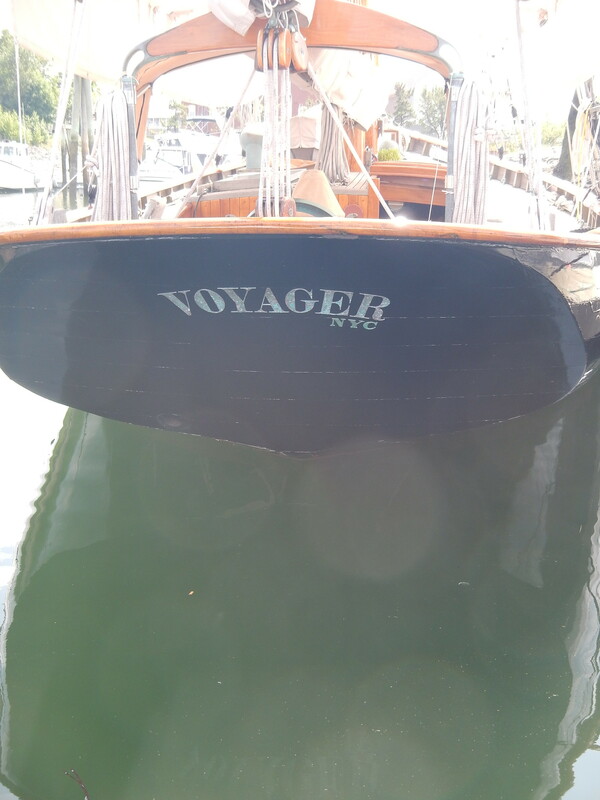 Years later when in Newport Harbor I again saw Voyager. Knocking on the hull I inquired if this was the same Voyager that was in Tiverton. 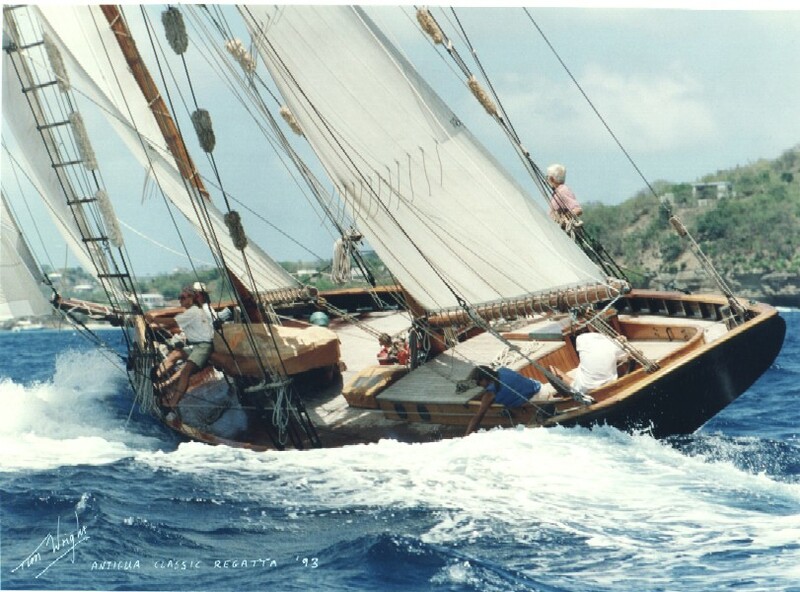 Peter Phillips, the owner, said it was and I told him how I had sailed her with the previous owner. He asked if I may have been the young boy he mentioned in an article he wrote for Wooden Boat Magazine. I was! Well let’s fast forward to August of 2014 in Rockland Maine. While touring the harbor in the dinghy we happened upon this beautiful Alden schooner, yes it was Voyager. Could it be, the same Voyager? Absolutely. We hailed to see if anyone was about and Peter’s wife was gracious to invite us aboard. Voyager has, over the years been rebuilt, both in Nova Scotia and in Thailand. She is to die for; originally built in 1929 she is in better structural condition than new with a modern layout below. 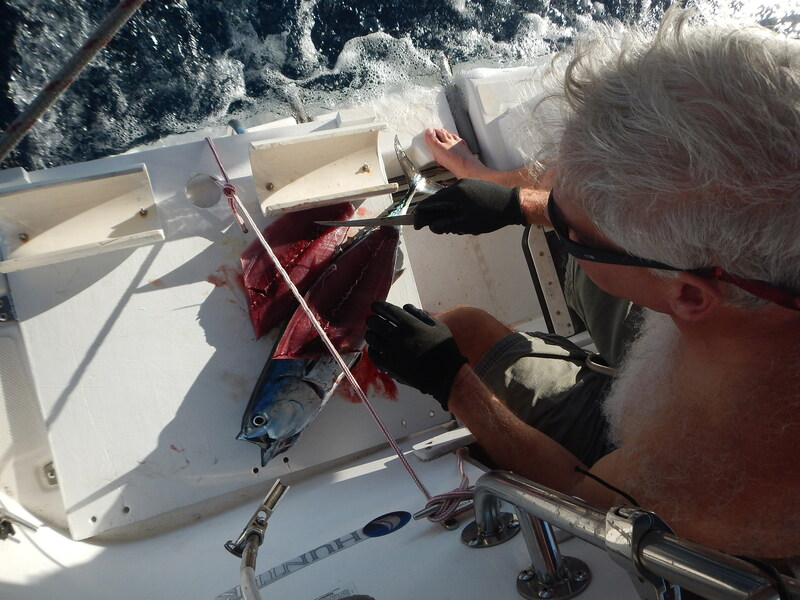 While in the Bahamas we had met Ed and Lynne on board Constance. 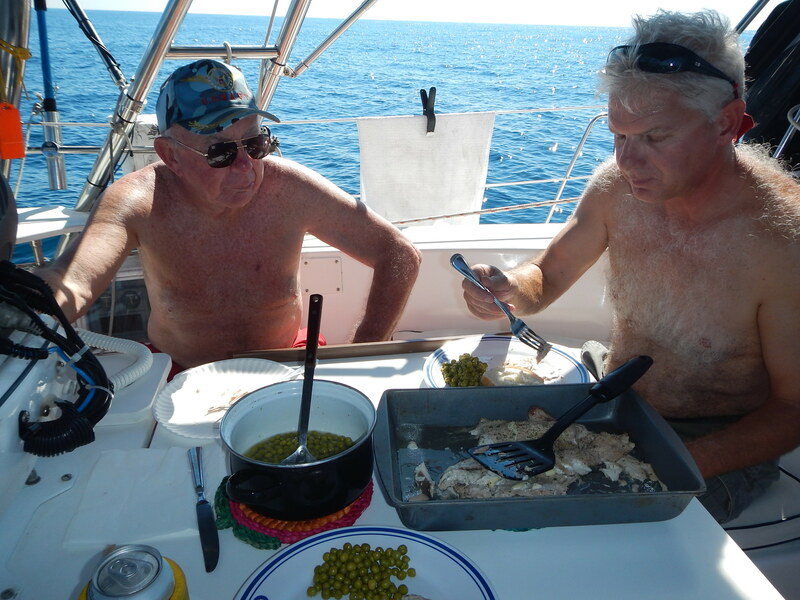 They had completed a seventeen year circumnavigation and were cruising the Bahamas. 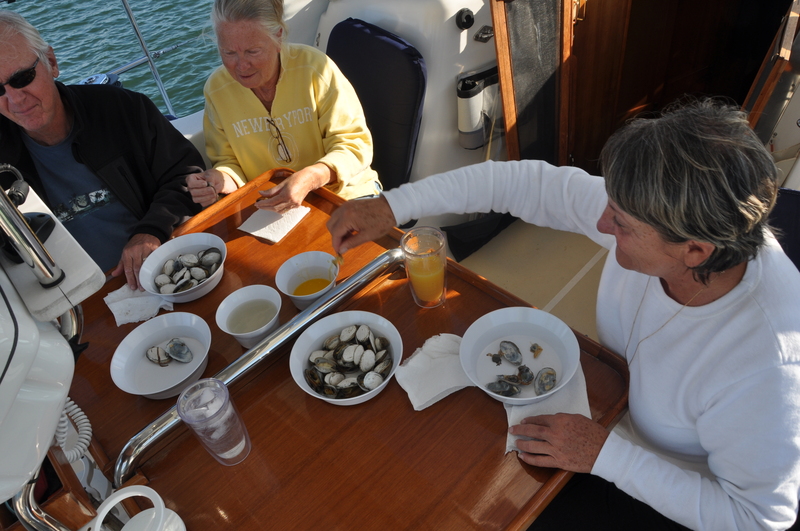 Having dinner one evening we were reminiscing over the differences of old wood boats vs. fiberglass. I was telling the story of how I had sailed and slept many nights aboard an old Alden schooner in Tiverton. Ed to my amazement said “That was Voyager, and you were the young boy that sailed with Dr. Dewing”. Ed, while circumnavigation the world, had met Peter Phillips in the south Pacific and was told the story of the young boy in Tiverton. At that time Voyager was also in the midst of her fifteen year circumnavigation. This is a very small word indeed. It was very sad to learn that Peter had passed away, I would so much liked to have talked to him again. Here are a couple of photos of Voyager that I found on line. Voyager at the dock in Rockland. The next morning we dropped the mooring and left for Stonington ME for lunch and then on to Swans Island. Stonington was so nice Ginnie and I thought we would look for a small vacation house. 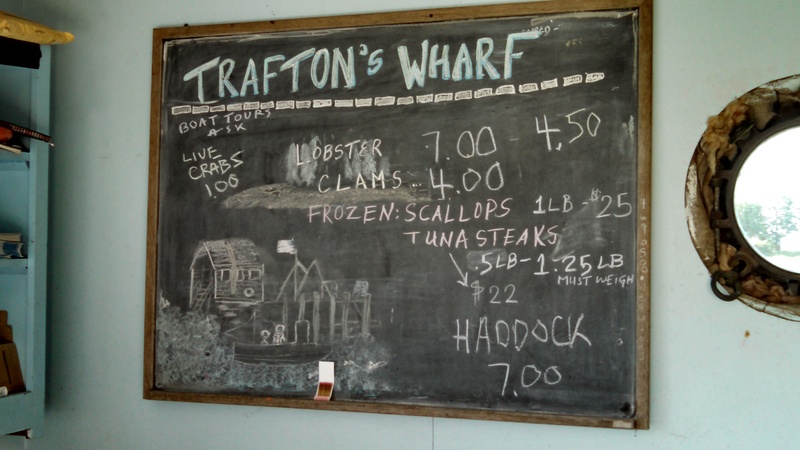 Dan had told us that “lobsters in the rough” could be had at Trafton’s Wharf. Buy them there, maybe get them cooked, and bring them back to the boat. Trafton’s looked to me to be just another tired fisherman’s wharf, and it was. But just as advertised by Dan, we were able to buy steamers and lobsters. The owner said he didn’t have time to cook them for us as he was leaving for a local chowder cook-off. 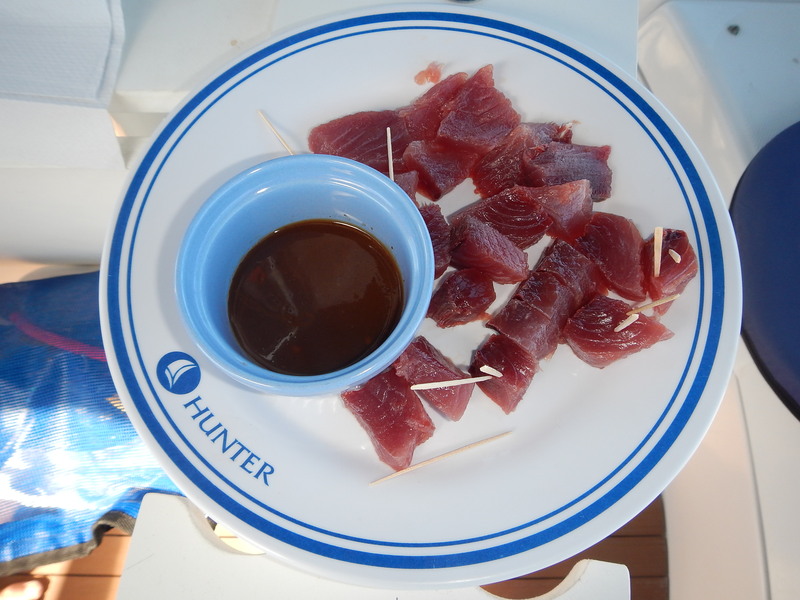 Dan said “no problem, can we cook them ourselves?” He agreed and we then had a feast on board. You have to love Maine! Chef Dan….Lobsters in the Rough. Lobsters and steamers with corn on the cob for four…..$45, not bad Dan! 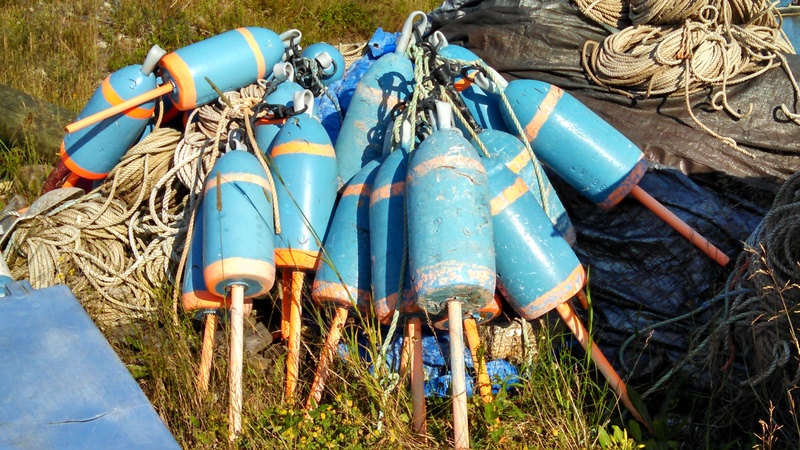 This photo is for Ginnie, she just loves to look for lobster pot buoys….NOT! Firecracker anchored in Burnt Coat Harbor at Swans Island. 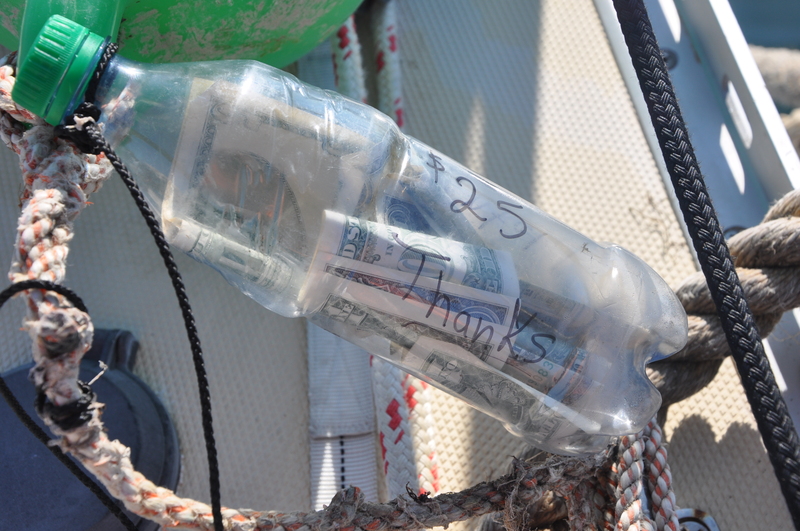 The mooring at Swan’s Island had a Coke bottle attached to the mooring pennant for payment. In the morning Ella and her dad came to empty the bottle. You really have to love Maine.